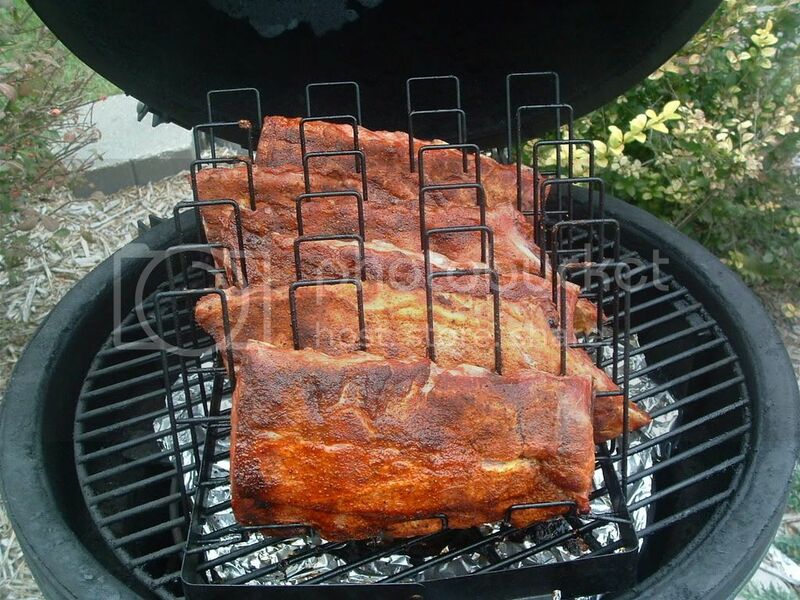 I'm looking for a new rib rack. 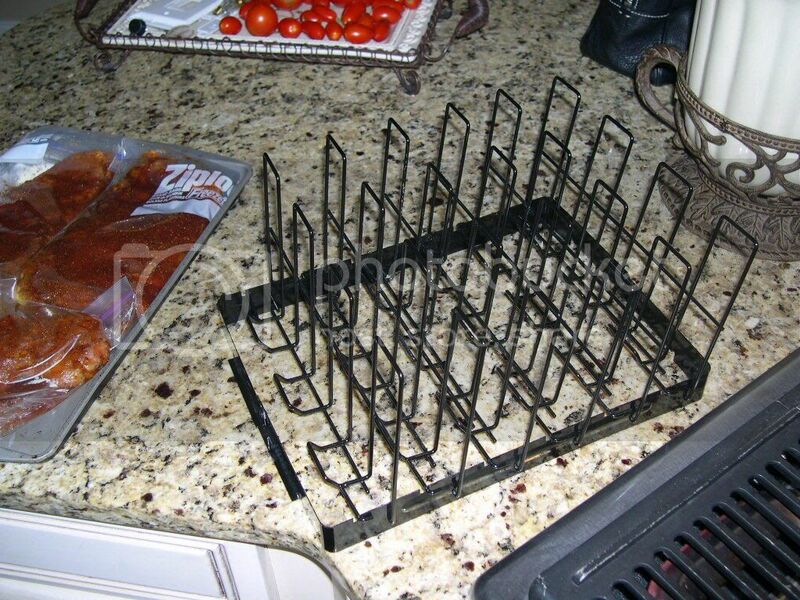 I thought I was pretty sneaky when I snuck down to Linens n' Things and bought one of those v-type turkey roaster racks on the cheap. I inverted it and thought shazam... a rib rack! Well, it kinda works and it looks like a lot of the ones you see in stores. The big problem is that there's nothing under the v, so you slip the ribs between the wires and then they just slide under and flop horizontal. So I'm thinking each rib needs its own little cage with sides and a bottom so it stays vertical. I'm willing to spend $20+ on a rack... I just don't want to spend $60 throwing away the first two till I find the right one. Home Depot sells one that's kinda flimzy. It's made from wire that's only about as thick as coat hanger wire. The design isn't bad, in that they hold the ribs more vertical and maybe a little tighter. 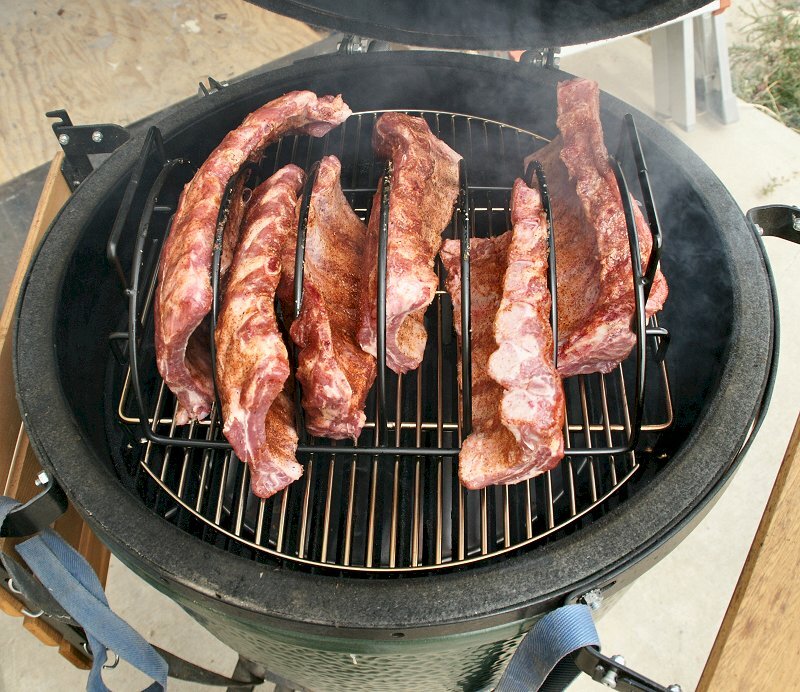 I've settled on cooking my ribs flat on the grate as my preferred method, but I've been thinking about experimenting with one of these to see if I can produce more ribs per cook. 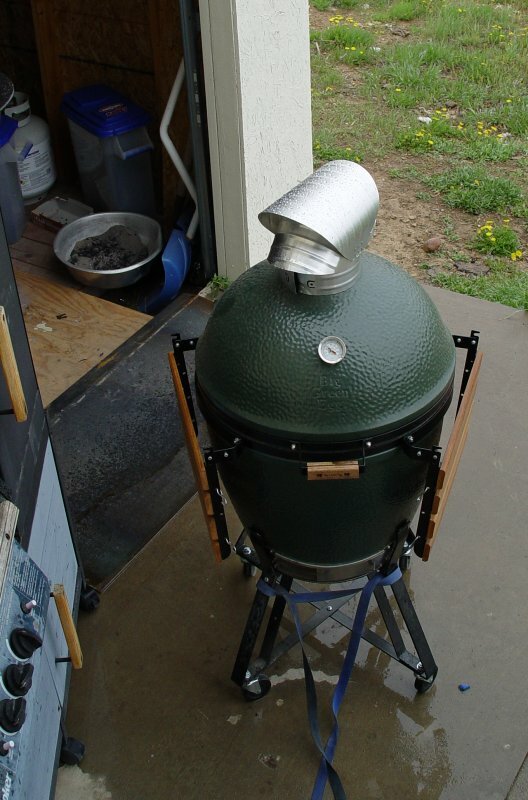 As I recall, this hits the dome on a Medium Egg if the grate is at gasket level. Some way of getting lower in the egg and still being indirect would be the key. I guess if you have a Large Egg, this will clear the dome and thermometer. Let us know if you find Utopia in that department. You could make some like these Mike and put 4 short rods that go down in between the rods on the grid so it can't slide. They fit in my Imperial Kamado Just fine. They're stainless steel too. Mine doesn't have anything under it either. I just position it carefully. I could probably just do them whole. I got mine on amazon. That rack sure looks bulletproof. But it's a little too rich for my blood. As luck would have it, I did a little surfing and came up with this from, of all places, Williams-Sonoma... definitely the last place in the universe I expected to find anything approaching a good deal. But they're having a sale. It normally sells for $40. On sale for $15.99. I'm a proud owner. LOL, it might. I use them to pull it in and out of the shed. Don't want it to fall. Got ya, That a good idea . 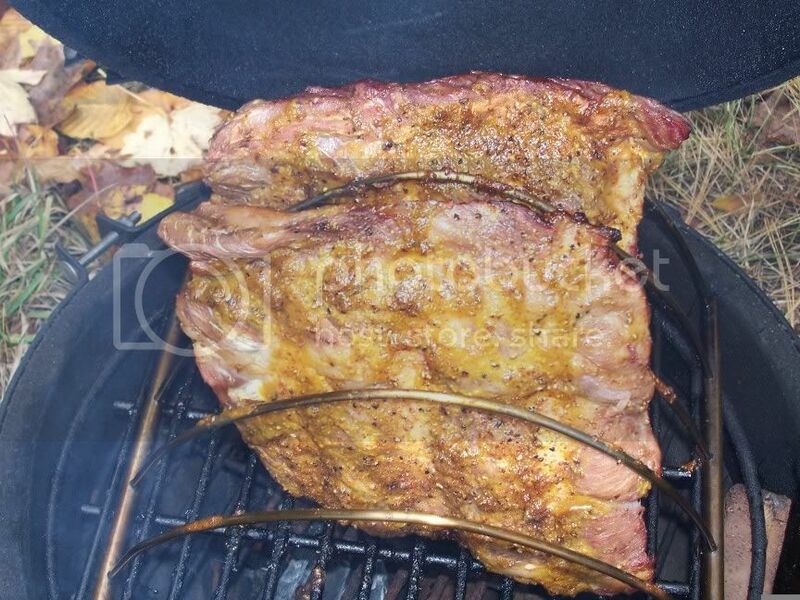 I have a Egg rib rack combo roast look very similar to your works great for me! That is a nice looking rack and you can't beat the price. Williams-Sonoma has occasional clearance sales, like this one, that actually produce good deals (who'd a thunk it?). What confuses me about the W-S listing is that it has two alternate pictures, and they don't seem to be of the same item. Since you own one, abundell, can you clear things up for me? i dont have a real good pic of mine, but it snaps tightly in the small, and on the second pic its tied down on the lower grid. normally i just cook them flat, but on the small its better to stand them with a direct cook because they are so low to the fire. Thats pretty neat...Did you make it in your shop? it was pretty simple, two pieces of round stock and then some welding wire bent and inserted into some drilled holes in the round stock. not as nice as the one you posted, but it works. Maybe I should have looked at your post before surfing and finding the same thing a half hour later... LOL. I own it only in the sense that I ordered it an hour ago when I saw it online. Haven't received it yet. I wondered about the picture, too. I'm expecting the one that looks like stainless. If I get the other one, I'll return it. No idea why there are two pics. I'm guessing it's a mistake. When I get it, I'll post regarding quality. I have 3 of these. They are of great quality. They don't show the brand, but they are the "Steven Raichlen" brand. If you have a store near you, call them up and they will search for stores that have them in stock. They are $9.99. They will ship 2 of them for $6.00. This rack was $10 at Lowes or Home Depot and my favorite one. I like the adjustable rig from eggessories.com. Let's me keep em flat (which makes it easier to sauce or spritz), and I could add a third level if needed. 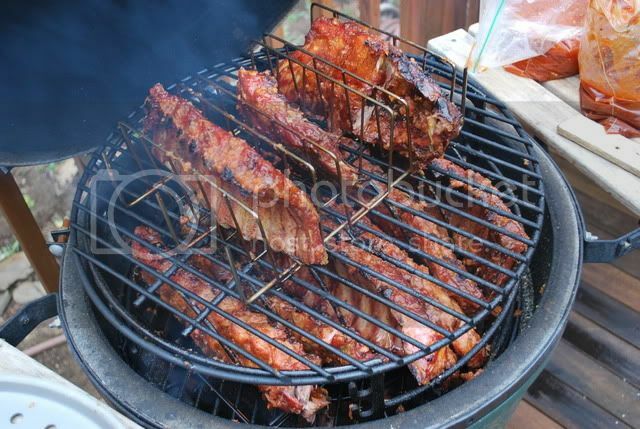 Do you use the sliding setup for this with ribs? Yep, the sliders work good. Must use the oval grids though. I do have a spider, but haven't used it yet. Like you, not sure of the grid size. I'm sold on stainless grids, and will probably order one from tjv, eventually. just not in a hurry, I guess. I just ordered my Adjustable Rig. Thanks for posting this. I went right out and ordered this. I have the cheapo one from Home Depot mentioned above and it works ok, but cleaning it is a pain in the you-know-what.